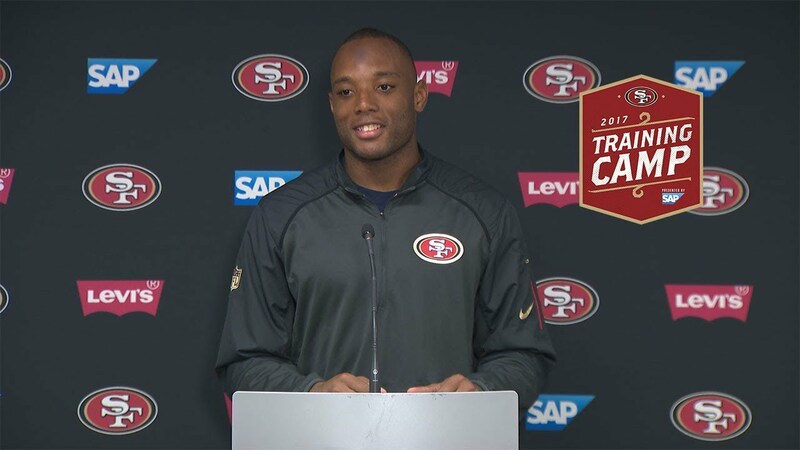 Matt Breida is an American football running back who began his professional career in 2017 as an undrafted free agent for the San Francisco 49ers of the National Football League (NFL). Prior to joining the league, he played college football for the Eagles football team of Georgia Southern University. Find out below, more about Matt, his family, parents, and wife. Matt was born as Matthew John Breida on February 28, 1995, in Brandon, Florida. He studied at Nature Coast Technical High School, Brooksville, Florida where he played high school football for the Sharks. As a junior, Matt Breida was the team’s running back. Done with high school, he moved on to Georgia Southern University for his college football career. In his sophomore year, Matt Breida recorded 1, 485 yards (second most by a GSU sophomore), 17 touchdowns on 171 carries, 8 receptions for 97 yards and a touchdown. The following year, he became even better, making 1, 609 yards (second in the conference) and a conference-leading 17 touchdowns on 203 carries. His sophomore and junior average yards per carry are the two best in the school’s history. During his senior year, these figures went down drastically partly due to the fact that he was moved to a triple option offense. He made 646 rushing yards and 3 touchdowns on 168 carries, alongside 11 receptions for 53 yards and 2 touchdowns. Despite his poor final season, Matt’s total rushing yards put him on the 6th position in the school history. Due to his very poor senior year record, Matt Breida was not invited to the NFL Combine. However, he attended Pro day and performed extremely well. He later signed with the San Francisco 49ers on May 4, 2017, as an undrafted free agent. On September 10, 2017, he made his professional debut in the season-opening game against the Carolina Panthers and finished his rookie season with 465 rushing yards, 2 rushing touchdowns, 21 receptions, 180 receiving yards, and a receiving touchdown. During Week 2 of the following season, Matt made his first career start. Matt Breida is the adopted son of Terri and Mike Breida. Although he is often referred to as the black boy with white parents, it is not an issue of concern to the running back who is eternally grateful to the only parents he has ever known. The couple adopted Matt on March 2, 1995, just two days after he was born and did a very good job nurturing him into the man he has turned out to be. According to the player, even though the couple did not have a lot, they gave him everything that they could. Despite the difference in skin color, Terri and Mike are Matt’s real mother and father by every standard and the player does not see them as otherwise. The couple got married when they were both 25 years old, living in Philadelphia. They had always wanted to have children but after trying to conceive for 10 years without any positive result, they silently gave up hope of having their own biological kids. They later relocated to Spring Hill, where Terri worked as a nurse at a hospital in Dade City. There, Terri witnessed an incident which made her opt for adoption. After they had gone through all the necessary processes of adoption, Mike and Terri were certified. On March 2nd, 1995, their adoption agency called to inform them of a two-day-old baby boy whose single mother already had two older children and could not afford to take care of a third one. Without thinking about it, the couple jumped at the offer and took Matt. They later adopted a second child, Josh, who is two years Matt’s junior. Unlike Josh who would like to know his real mother, Matt does not bother. He knows his biological mother and father were 5-foot-1 and 6-1 respectively and also knows he has an older brother and sister somewhere on the planet. In addition, the footballer knows his birth mother gave him up for adoption hoping he would have a better life than she could give him. That is all he knows and, at least for now, that is all he cares to know. According to him, he has never even thought of knowing his parents as he is happy and grateful to be the son of the Breidas. The star player watched both of his parents become disabled for life. It began with his father who was hit by life-threatening meningitis. Although he survived it, he became permanently mentally disabled because the disease left him with an irreversible brain damage which also affected his memory and his ability to solve problems. In 2003, he was involved in a car accident which eventually confined him to a wheelchair. This was a very difficult time for the family and they had to move from where they lived, to an apartment. However, they were able to move back into a house two years later. As if that was not enough trouble already, Terri got involved in a more terrible accident in 2006 and was robbed of the use of her legs. Now she moves around in a wheelchair. Matt got married to his high school sweetheart, Silvana Breida (nee Paonessa), in April 2018. She was born on February 2, 1994, in Brooksville, Florida, to Angela and Frank Paonessa. Silvana has two siblings- Dominic (brother) and Santina (sister). She attended Nature Coast High with her husband and graduated in 2013. While in high school, they were football teammates. As a junior, Silvana was the team’s kicker. In 2011, she became the first ever female football player in the history of Hernando County when she made her debut in the game which ended in a 42-0 for the Sharks. At the end of the season, Matt led the team in scores with Silvana following in the second position. That was, however, her first and final season of playing the pigskin sports. Apart from football, Matt’s wife also played soccer. In fact, it was her best sport. Matt Breida might not be the tallest player in the NFL, but his height of 5 feet 9.2 inches (1.79 m) and weight of 91kg (200 lb) haven’t put him out from performing his duties on the field.